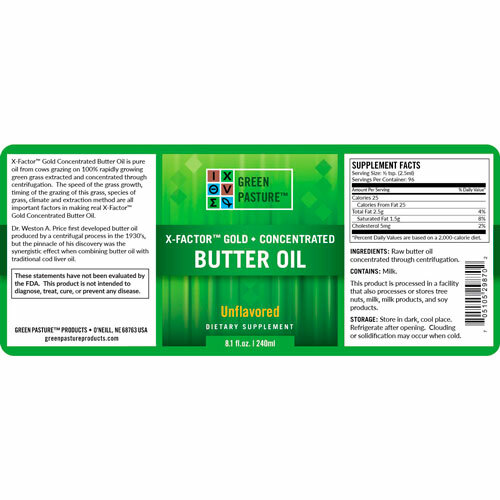 This Green Pasture X-Factor Gold High-Vitamin Butter Oil is extracted from dairy milk produced by cows that graze exclusively on irrigated grass of the Northern Great Plains. The combination of climate and irrigation produces a rapidly growing specialized forage ensuring optimal levels of Activator X. Casein and lactose-free! Ingredients: High Vitamin Butter Oil, unbleached beeswax (as a thickener). Capsules are made from plant cellulose (non-gelatin). View label. X-Factor Gold™ High Vitamin Butter Oil is made from dairy oil extracted without heat from cows that eat 100% rapidly growing grass. 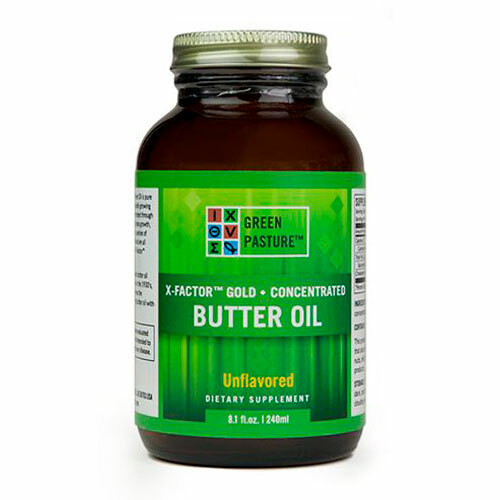 The speed of the grass growth, the timing of the grazing of this grass, species of grass, climate and extraction method are all important to make real X-Factor Gold™ High Vitamin Butter Oil. Dr. Weston A. Price first discovered High Vitamin Butter Oil in the 1930s. But the pinnacle of his discovery was the synergistic effect when combining High Vitamin Butter Oil with traditional cod liver oil.